Kade had his date with Mickey today. 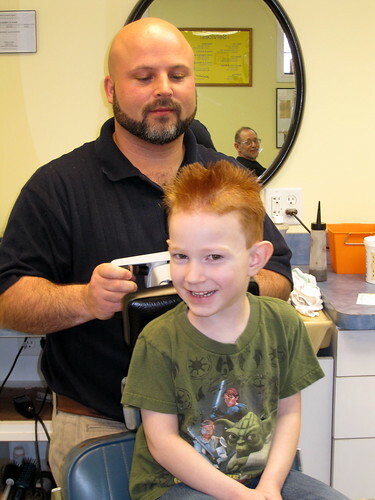 Mickey really needed a haircut and Kade kind of needed one too. After stopping for some lunch they went to the barber shop. Kade got his hair cut by Mike. Today he got it spiked. Afterwards Mike used the "dassager" on Kade's back. It's his favorite part of the visit. For the second part of the date Kade went to Strikes and Spares to race the go-karts. He "raced other people and one was behind and three was in front of me". This was his third time going and it's now his most favorite thing to do. I'll have to go next time to watch this kid in action. Maybe we'll get some video. One part Kade left out of the story was the emergency trip home after he spilled his chocolate milk all over his pants at McDonalds. A couple of phone calls, one to the barber to tell him we'd be late and one home to ask Kelly to have clothes at the door, and it was all good. No need to cry over spilled milk! Noah got a Mohawk on Friday! Be sure to spike Kade's for school on Monday.